N. Sperelakis, Regulation of the Calcium Slow Channels of Heart by Cyclic Nucleotides and Effects of Ischemia. P.F. Wouters, H. Van Aken, M. Van de Velde, M.A.E. Marcus, and W. Flameng, Functional Adaptation to Myocardial Ischemia: Interaction with Volatile Anesthetics in Chronically Instrumented Dogs. D.F. Stowe, Excitation-Contraction Uncoupling and Vasodilators for Long-Term Cold Preservation of Isolated Hearts. H. Machler, H.Gombotz, K. Sabin, and H. Metzler, Troponin T as a Marker of Perioperative Myocardial Cell Damage. A.G. Hedman, Silent Myocardial Ischemia: Pathophysiology and Perioperative Management. B. Drenger, Y. Ginosar, and Y. Gozal, Effect of Halothane on Sarcolemmal Calcium Channels during Myocardial Ischemia and Reperfusion. D.M. Van Winkle, G.L. Chien, and R.F. Davis, Myocardial Ischemic Preconditioning. P.R. Knight, M.D. Smith, and B.A. Davidson, Effects of Hypoxia/Reoxygenation on Intracellular Calcium Ion Homeostasis in Ventricular Myocytes during Halothane Exposure. P.S. Pagel and D.C. Warltier, Mechanical Consequences of Calcium Channel Modulation during Volatile Anesthetic-Induced Left Ventricular Systolic and Diastolic Dysfunction. N. Miao, M.J. Frazer, and C. Lynch, III, Anesthetic Actions on Calcium Uptake and Calcium-Dependent Adenosine Triphosphatase Activity of Cardiac Sarcoplasmic Reticulum. L.A. Turner, S. Vodanovic, and Z.J. Bosnjak, Interaction of Anesthetics and Catecholamines on Conduction in the Canine His-Purkinje System. J.L. Atlee, III, M.N. Vicenzi, H.J. Woehlck, and Z.J. Bosnjak, Anesthetics, Catecholamines, and Ouabain on Automaticity of Primary and Secondary Pacemakers. T.J.J. Blanck, D.L. Lee, S. Yasukochi, C. Hollmann, and J. Zhang, The Role of L-Type Voltage-Dependent Calcium Channels in Anesthetic Depression of Contractility. H. Komai and B.F. Rusy, Effects of Inhibition of Transsarcolemmal Calcium Influx on Content and Releasability of Calcium Stored in Sarcoplasmic Reticulum of Intact Myocardium. N. Buljubasic, J. Marijic, and Z.J. Bosnjak, Potassium Channel Current and Coronary Vasodilatation by Volatile Anesthetics. D.R. Larach, H.G. Schuler, K.A. Zangari, and R.L. McCann, Potassium Channel Opening andCoronary Vasodilation by Halothane. J.R. Kersten, J.C. Hartman, P.S. Pagel, and D.C. Warltier, Volatile Anesthetics and Coronary Collateral Circulation. G.J. Crystal, Myocardial Oxygen Supply (Demand Relations during Isovolemic Hemodilution. D. Kosk-Kosicka, Plasma Membrane Ca2+-ATPase as a Target for Volatile Anesthetics. J.E. Fletcher and V.E. Welter, Enhancement of Halothane Action at the Ryanodine Receptor by Unsaturated Fatty Acids. D.A. Schwinn, Adrenergic Receptors: Unique Localization in Human Tissues. A.S. Evers and M.D. Hossain, Volatile Anesthetic Effects on Inositol Triphosphate-Gated Intracellular Calcium Stores in GH3 Cells. J.L. Seagard, Differential Control of Blood Pressure by Two Subtypes of Carotid Baroreceptors. T.J. Ebert and M. Muzi, Sympathetic Activation with Desflurane in Humans. M. Muzi and T.J. Ebert, Randomized, Prospective Comparison of Halothane, Isoflurane, and Enflurane on Baroreflex Control of Heart Rate in Humans. T.A. Stekiel, L.B. Bell, Z.J. Bosnjak, and J.P.Kampine, Effects of Isoflurane on Regulation of Capacitance Vessels under Normotensive and Chronically Hypertensive Conditions. J.B. McCallum, T.A. Stekiel, A. Stadnicka, Z.J. Bosnjak, and J.P. Kampine, Effect of Volatile Anesthetics on Baroreflex Control of Mesenteric Venous Capacitance. M. Wood, Effect of General Anesthesia on Modulation of Sympathetic Nervous System Function. M. Jeng, J.L. Hart, S. Bina, and S.M. Muldoon, Inhibition of Nitric Oxide-Dependent Vasodilation by Halogenated Anesthetics. Q.H. Hogan, A. Stadnicka, and J.P. Kampine, Effects of Epidural Anesthesia on Splanchnic Capacitance. P.A. Murray, Anesthetic Modulation of Pulmonary Vascular Regulation. R. Dueck, Pulmonary Mechanics Changes Associatedwith Cardiac Surgery. W.M. Zapol and W.E. Hurford, Inhaled Nitric Oxide in Adult Respiratory Distress Syndrome and Other Lung Diseases. D.L. Roerig, S.B. Ahlf, C.A. Dawson, J.H. Linehan, and J.P. Kampine, First Pass Uptake in the Human Lung of Drugs Used during Anesthesia. Y. Huang, J.B. Yee, W.-H. Yip, and K.C. Wong, Lactic Acidosis and pH on the Cardiovascular System. L.E. Moore and R.J. Traystman, Role of Oxygen Free Radicals and Lipid Peroxidation in Cerebral Reperfusion Injury. A. Hudetz, J.G. Lee, J.J. Smith, Z.J. Bosnjak, and J.P. Kampine, Effects of Volatile Anesthetics on Cerebrocortical Laser Doppler Flow: Hyperemia, Autoregulation, Carbon Dioxide Response, Flow Oscillations, and Role of Nitric Oxide. M.M. Todd, Cerebral Blood Flow during Isovolemic Hemodilution: Mechanistic Observations. B. Hindman, Cerebral Physiology during Cardiopulmonary Bypass: Pulsatile versus Nonpulsatile Flow. W.T. Schmeling and N.E. Farber, Anesthetic Actions of Cardiovascular Control Mechanisms in the Central Nervous System. Subject Index. Contents of Previous Volumes. Each volume of Advances in Pharmacology provides a rich collection of reviews on timely topics. 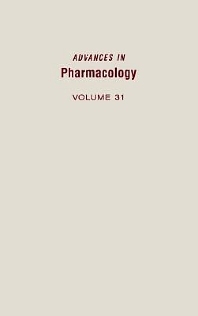 Volume 31 deals with the mechanisms of anesthetic actions under normal conditions as well as pathophysiologic states. Researchers, students in pharmacology, cardiovascular physiology, academic cardiologists, and anesthesiologists. The Medical College of Wisconsin, Milwaukee, U.S.A.
John Hopkins University; Department of Pharmacology, Baltimore, Maryland, U.S.A.
University of Rochester; Department of Pharmacology, New York, U.S.A.